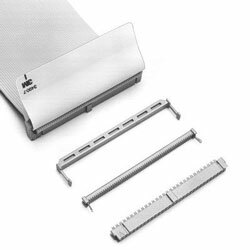 These 3M 3000 series cable mount industry standard IDC ribbon cable socket connectors have a 2.54mm x 2.54mm pitch, and the cable sockets accept 26 AWG and 28 AWG solid and stranded 1.27 mm pitch flat ribbon cable or discrete wire. The use of IDC contacts removes the necessity for prior cable preparation and stripping, and offers a quick and simple interconnection system for mass termination. The contacts are made from beryllium copper, providing a high resistance to corrosion, excellent wear resistance and greater electrical conductivity than brass or bronze. The housings of these sockets offer dual slot defence polarisation to support accurate mating with the header connector. These ribbon cable sockets provide positive locking metal ‘J’ clips that ensure the cover of the connector is securely retained. These covers have a transfer adhesive on them to hold the cover onto the ribbon cable for accurate alignment between the connector and the cables. This feature also helps with the production of high yield terminations. A pull tab is offered separately which can be attached to the socket using a strip of adhesive. The pull tab reduces stress on the cable terminations when the socket connector is unplugged from the mated header. A keying plug is also offered which plugs into a socket contact to stop the male pin entering it.